We’re dead in the middle of a Steam Summer Sale right now, and this year’s sale comes a little later than it did last year: starting on June 24 and ending on July 4. Dispensing with the flash sales, this year, sale prices are fixed throughout the entire sale at one rate to ensure that everyone who’s interested in a game can buy it at a constant price without waiting around for the flash sales. 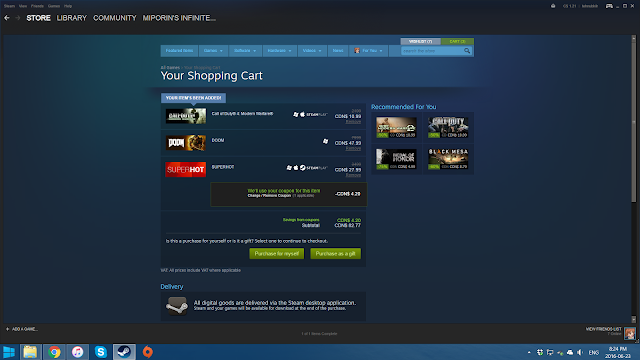 In addition, gone are the somewhat chaotic events of last year’s summer sale, which featured an 8-bit monster hunting theme that allowed for interesting badges to be unlocked and the previous year’s infamous team event; the 2016 sale is simpler in nature, following the Winter 2015 sale in providing trading cards through viewing one’s discovery queue. This approach shifts the sale event back to the sales itself, as opposed to earlier years, where the events appeared to generate more interest than the discounts themselves. I rather prefer this approach, and in the 2016 iteration of the sale, my wallet lightens considerably as I add DOOM, Call of Duty 4: Modern Warfare, Refunct, SUPERHOT and the Go! Go! Nippon! 2015 DLC to my library of titles. At the time of writing, now that I’m afforded some time to relax, I’ve gone back to beat SUPERHOT‘s campaign to unlock challenges and endless mode. In addition, I’ve also returned to Pripyat with Captain MacMillan in Call of Duty 4: Modern Warfare. 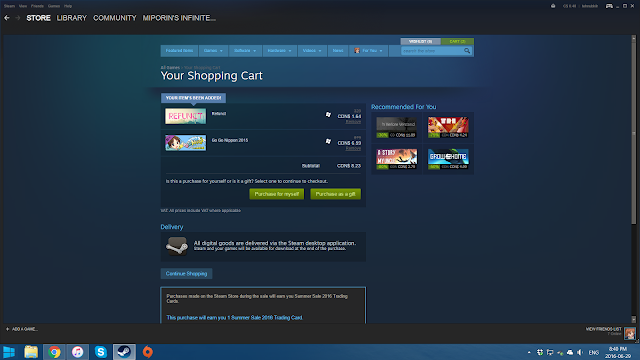 This is perhaps one of the biggest single purchases I’ve made on Steam at any one given time: the prices were driven up by the fact that DOOM is still a lofty 48 CAD even with its 40% off sale. Armed with the 20% off discount and a bonus 15% off coupon, SUPERHOT becomes a more reasonable 23 dollars. I did say that if the game cost 25 dollars or less, I would pick it up without any questions. Finally, Call of Duty 4: Modern Warfare is a game I’ve been looking to introduce into my library: it’s an amazing single-player experience that I longed to experience again ever since playing through it four summers ago on a friend’s account. Thanks to the discovery queue, I learned that Go! Go! Nippon had new DLC, bringing the game into 720p and offering nearly double the content compared to the base game. I’ve beaten the Makoto route, but the DLC brings the game into the modern era, with higher resolution artwork and new places to explore. I came across Refunct through the discovery queue, as well: it is through this queue that cards are earned, and it’s relatively straightforwards to accumulate enough cards to obtain a summer sale badge. 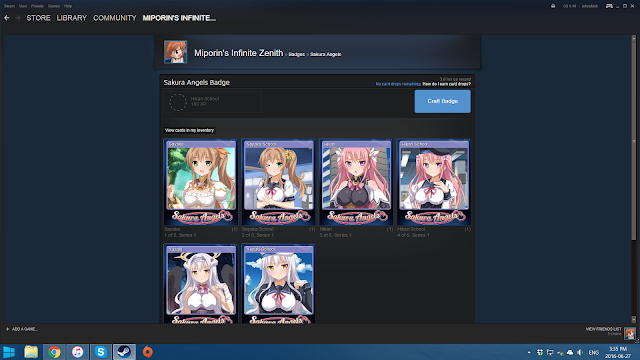 I also decided to capitalise on the heat of things to get a Sakura Angels badge: last year, I did mention that I would craft the badge, and the result was that I got a cool emoticon and wallpaper out of it. With my graduate programme ending now, I will need to decline some of the scholarships I was offered and figure out what else, besides revising the thesis, needs to be done before I can graduate for real. For now, however, I will take things easy and enjoy Canada Day tomorrow: it’s a well-earned break after nearly six full months of solid work, and I’m looking forwards to an adventure in the mountains. 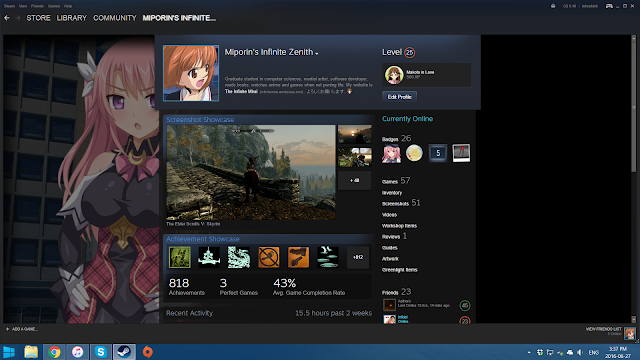 As I’ve mentioned last year, these screenshots of my current Steam profile give some insight into how things change over time. In this year’s post, only the iTunes logo is different, and a close inspection finds that I’m now level 25 in Steam compared to last year’s 22. I’ve also got 218 more achievements and two more perfect games. Looking back at some of my reflections on games during 2015, I’ve finally purchased SUPERHOT after much anticipation from last summer (in fact, I’ve been waiting for SUPERHOT to release since September 2013 after a friend showed me the prototype). In addition, DOOM enters my library: it’s looking to be a fantastic game, and I cannot wait to purchase a new GPU to see how fantastic DOOM looks on it. Similarly, four years after my MCAT, I finally have the opportunity to crawl through Chernobyl in a ghille suit in 1080p. This has been a wonderful sale, and my eye now turns to pre-ordering Deus Ex: Mankind Divided once I return from my conference; standing as one of the best games I’ve ever played, Deus Ex: Human Revolutions set a new standard for what constitutes a good game, and it’ll be exciting to see where Mankind Divided will go with Adam Jensen’s story. For the present, there are some four days left in this year’s sale, and I’m quite pleased with this year’s acquisitions: between these games and Mankind Divided, there will be no shortage of games for those rainy days where I do not feel like talking a hike in a nearby civic park or getting some friends together for wings and beer.